, a learned Italian, and the reviver of the Platonic philosophy in the West, was born at Florence in 1433, where his father was physician to Cosmo de Medici, and sent his son to pursue that study at the university of Bologna. Marsilius obeyed him with some reluctance, but having made a short trip from Bologna to Florence, his father took him with him on a visit to Cosmo de Medicis, which gave a new turn to his life and studies. Cosmo was so charmed by his appearance and his spirited answers, that from that moment, although Marsilius was at this time merely a youth, he destined him to be the principal of the Platonic school which he was about to form. With this view he brought him to reside with him, superintended his studies, and treated him with so much kindness, that Marsilius regarded him ever after as a second parent. He made such rapid progress in the study of philosophy, that he was only twenty-three years old, when he wrote his four books of the Institutions of Plato. Cosmo and the learned Landino, to whom he shewed the manuscript, highly applauded his labours, but advised him to learn Greek before he should publish them. This he accordingly studied with his usual ardour, and gave the first proof of the progress he had made by translating the hymns of Orpheus into Latin. Reading about the same time in Plato that heaven had bestowed music on man in order to calm his passions, he learned that science also, and amrised himself with chanting the hymns of Orpheus, accompanying himself with a lyre resembling that of the Greeks. 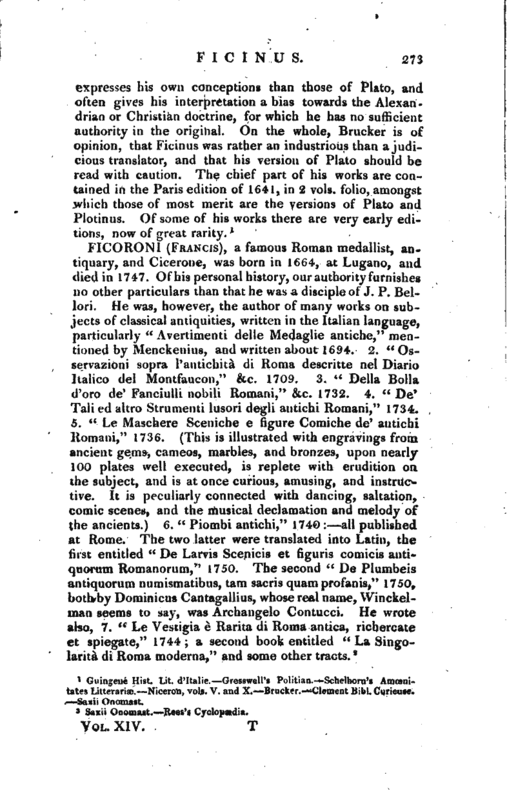 H translated afterwards the book on the origin of the world attributed to Mercurius Trismegistus, and having presented these first-fruits of his Greek studies to his patron, Cosmo rewarded him with a grant of some land at Careggi, near Florence, and with a house in the city, and some very magnificent manuscripts of Plato and Plotinus. Marsilius now undertook the entire translation of Plato, which he completed in five years, and was then in his thirty-fifth year. 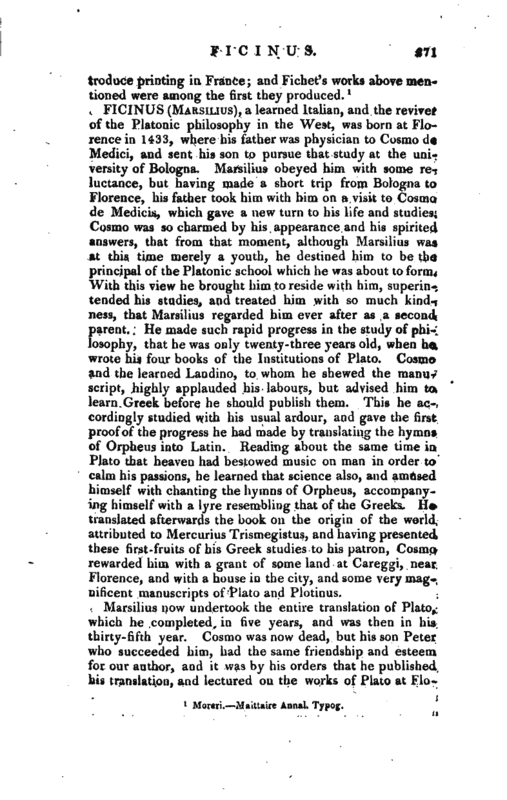 Cosmo was now dead, but his son Peter who succeeded him, had the same friendship and esteem for our author, and it was by his orders that he published his translation, and lectured on the works of Plato at | Florence to an audience composed of the eminent scholars of Europe who were most conversant in ancient philosophy. Lorenzo also extended his patronage to Marsilius, who having taken priest’s orders in his forty-second year (1475), Lorenzo bestowed several henefices on him, which rendered him easy in his circumstances. More he never wished, and when, by Lorenzo’s bounty, he had attained this competency, he made over his patrimony to his relations. His time was now divided between his ecclesiastical duties and his philosophical studies. 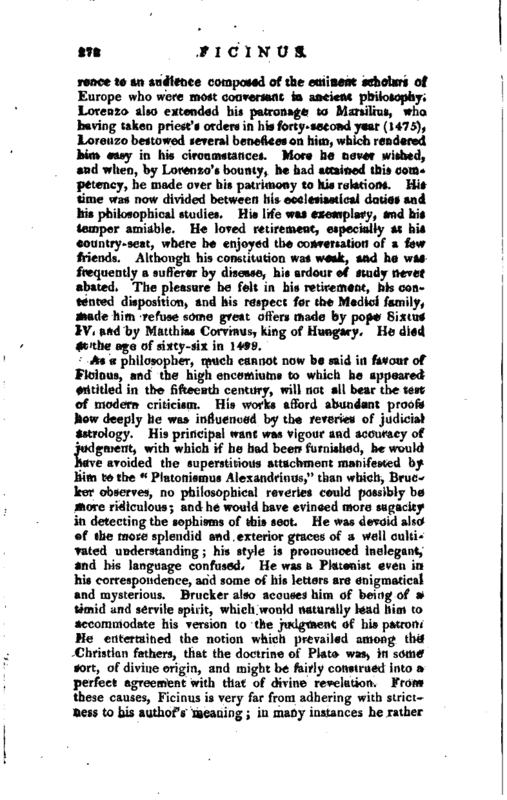 His life was exemplary, and his temper amiable. He loved retirement, especially at his country-seat, where he enjoyed the conversation of a fevf friends. Although his constitution was weak, and he was frequently a sufferer by disease, his ardour of study never abated. The pleasure he felt in his retirement, his contented disposition, and his respect for the Medici family, made him refuse some great otters made by pope Sixtus IV. and by Matthias Corvinus, king of Hungary. He died at the age of sixty-six in 1499. Guingene Hist. Lit. d’ltalie. Gresswell’s Politian. Schelhorn’s Amoenitales Litterariac. —Niceron, vols. V. and X. Brucker. Clement Bibl. —Saxii Onomast.